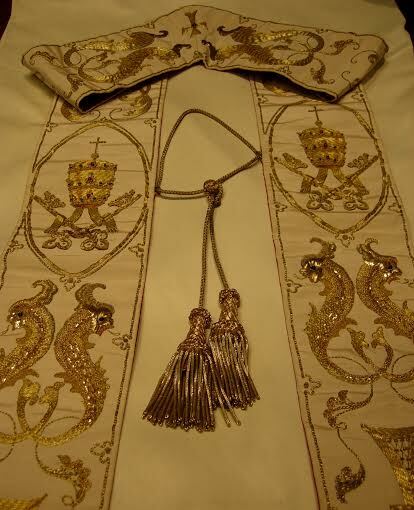 Pope John XXIII’s stole. Used with permission of the Merton Legacy Trust. Merton was right. Pope John XXIII would be canonized, raised to the altars by Pope Francis, a man many justifiably compare to the “good pope,” particularly for his simplicity and pastoral sensibilities, not to mention his propensity to raise the hackles of traditionalists. Moreover, in the year-and-a-half since he was elected, Pope Francis’ pontificate has been marked in part by an emphasis on ecumenism and on issues of peace and justice, precisely those ideas that appeared to bring Merton before the attention of Pope John XXIII. It makes sense, therefore, that Pope Francis’ trip to the United States next year should include a visit to Kentucky in order that he might connect with a figure of great importance in the history of American Catholicism and one whose writings on contemplation, justice, peace, as well as interreligious and ecumenical dialogue correlate so closely with key themes of Francis’ pontificate. It makes even more sense when one takes into account that 2015 marks the 100th anniversary of Merton’s birth, and celebrations to mark the centenary are planned throughout the year, including a conference in June at which the Rt Rev. Rowan Williams, former Archbishop of Canterbury and friend of Pope Emeritus Benedict XVI, will give one of the plenary lectures. What better time for Pope Francis to draw attention to Merton? 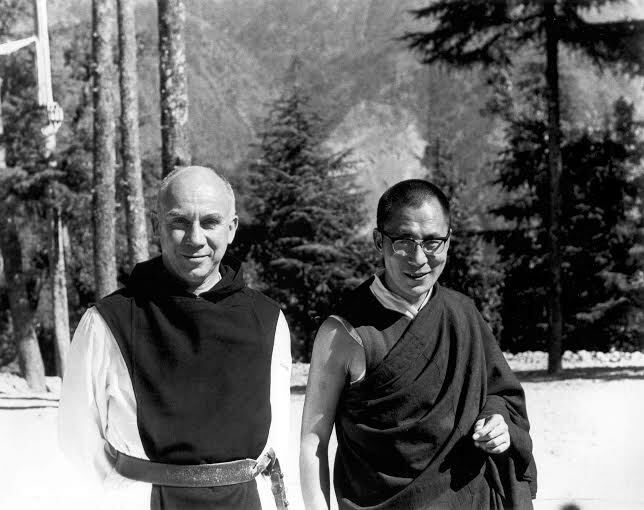 Merton and the Dalai Lama. Used with permission of the Merton Legacy Trust. Were he to come to Kentucky, I’d suggest the following itinerary. Pope Francis would first make a brief visit to the Merton Center at my school, Bellarmine University in Louisville. In 1967 Thomas Merton named Bellarmine the official repository of his manuscripts, letters, journals, tapes, drawings, photographs, and memorabilia, and the Merton Center (established in 1969) currently houses well over 50,000 Merton-related materials. The pope would see on display the stole given to Merton by Pope John XXIII, a cross given to him by Pope Paul VI, and a few of Merton’s personal effects – his camera, glasses, coffee mug, and cowl. He would also see the vast number of books that contain Merton’s marginalia, books ranging from Camus in French, to the Fathers in Greek and Latin, to St John of the Cross in Spanish. Maybe Merton’s turn toward the world was another reason Pope John XXIII liked him. For we find in John a similar turn toward the world in his opening address to the Second Vatican Council, in which he lamented those “prophets of doom” who saw in the world “ruin and calamity,” and instead proposed that “human society seems to be entering a new order of things” through the guidance of divine providence. 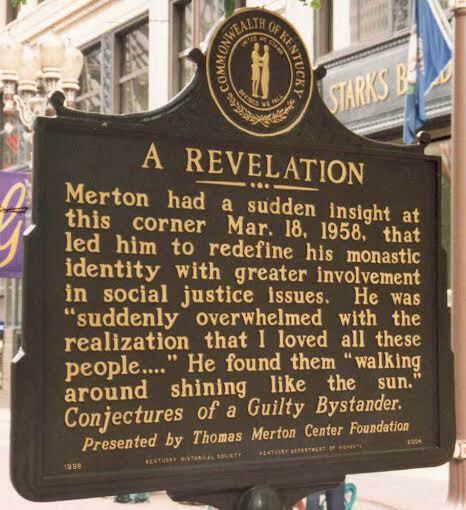 Plaque commemorating Merton’s insight at the corner of Walnut and 4th in Louisville, KY. Used with permission of the Merton Legacy Trust. In that last sentence, Francis summed up Merton’s 4th and Walnut experience as well as his later efforts for peace and justice. Pope Francis’ Kentucky visit would conclude by a trip out to the Abbey of Gethsemani, an hour south of Louisville. Here the pope could talk with monks who knew Merton, visit Merton’s grave, and spend some time in silence and prayer at the hermitage Merton called his home for the last three years of his life. I don’t know how much Pope Francis knows about Merton and his writings. I’ve found no explicit references to Merton in anything he’s said or written so far. But the points of convergence between Merton and Pope Francis are many, and I’ve little doubt that his writings would resonate with the pontiff as they appeared to do with Pope John XXIII. And were he alive today, I’ve no doubt that Merton would feel the same love for Pope Francis that he did for Pope John XXIII. This post is part of Daily Theology’s Theological Shark Week VI: What Should Francis Do? See all the posts here. Gregory K. Hillis, Ph.D. is associate professor at Bellarmine University where he directs the Master of Arts in Spirituality Program. His blog is My Unquiet Heart, and his Twitter handle is @gregorykhillis. (1) A Search for Solitude: The Journals of Thomas Merton – Vol. 3 (1952-1960), Lawrence S. Cunningham, ed. (San Francisco: HarperSanFrancisco, 1996), 228-229. (2) The Hidden Ground of Love: Letters on Religious Experience & Social Concerns, William H. Shannon, ed. (New York: Harcourt Brace Jovanovich, 1985), 485. (3) Turning Toward the World: The Journals of Thomas Merton – Vol. 4 (1960-1963), Victor A. Kramer, ed. (San Francisco: HarperSanFrancisco, 1996), 327. (4) Conjectures of a Guilty Bystander (New York: Image, 1966), 153-155. Sorry I am two years late. //// Great commentary. Thank you so much.